Did you know that when you walk, the pressure on your feet exceeds your body weight? When you run the pressure can exceed 3-4 times your body weight. It’s easy to see why 75% of people experience foot problems at some time. Unfortunately, your feet are not like the tires on your car, you can’t replace them. But you can protect your most valuable mode of transportation with proper shoes. Unfortunately, athletic shoes have no expiration date on them. There are many factors to consider before hanging up your old shoes for new ones, including how long your athletic shoes will last. Shoe longevity depends on many things, including how often you wear them, where you run or walk, foot type and foot health, your workout conditions and most importantly your mileage. Contrary to popular opinion however, you cannot always tell whether a shoe is worn out by visual inspection. With so many advances in shoe technologies today, the outer sole can hold up and not show breakdown even after the shock absorption and stability capacities of the shoe are gone. One of the most common causes of foot injuries I see are patients wearing old athletic shoes, specifically for running, or wearing the wrong type of shoes for your foot or for a specific sport. For example, running in a shoe that no longer provides traction, support, and cushioning can lead to a number of musculoskeletal complaints, among them heel pain, shin splints, and stress fractures. 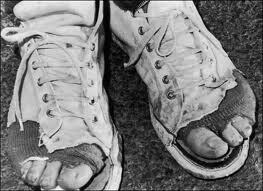 For the average person, the basic rule of thumb is to replace their shoes every 300-500 miles. Type of shoe and type of foot: Ask Dr. Adam Teichman about specific shoes that are best for your foot type. Some shoes are designed to accommodate pronation or supination. We will provide you a copy of our up to date shoe list and recommend shoes for your foot type. The type of environment you run in: A humid climate can contribute to a shoe’s rapid breakdown because running in a wet shoe will overstretch the upper part of the shoe while over-compressing the lower part. Body weight: Weight is a big factor in determining which shoe is best for you. The more you weigh, the more cushioning your feet will need. Mileage: The mileage you put on your shoes and the length of time in your shoes can also affect its life. Mileage can easily be tracked by walkers and runners to determine wear. Buy a second pair of shoes about half-way through the life of your old shoes and rotate them in during workouts. Having a newer pair will also help you identify the feel of shoes that have worn out. East Penn Foot and Ankle Associates is here to help your feet last a lifetime, but your shoes are not designed to do the same. Replace worn athletic shoes as often as needed and work with East Penn Foot and Ankle Associates to keep your feet healthy and injury-free and help you make your next step pain free.